In most Indian kitchens (and even weddings), I am told that cooked lentils are not directly added to Mysore Rasam , but rather the lentil extract (or kattu as it is called in Tamil /kannada) is added along with tamaraind / tomato making it as light as a shorba. This is directly consumed as it is on rainy / wintery evenings as a soothing comforting drink or mixed with hot steamed rice and ghee !! Yummmm..
4) Dry roast cumin, dhaniya seeds and red chillies and grind in a spice grinder along with rasam powder and hing. 5) Once dal is cooked, decant the water on top to a vessel. Mash the dal lightly separately. 6) In a deep bottomed pan, heat ghee. Add the water from the dal (lentil), salt, jaggery, ground spice powder and let it come to a rolling boil. Add 2 tbsp of cooked dal now. Check for salt and continue boil for 2 mins more. Transfer to a serving bowl. 7) Prepare tempering with ghee, mustard seeds, curry leaves and coriander and pour onto the rasam. Drink it as it is, or mix with hot steamed rice !! I add a little of fresh coconut also while grinding...Love this. love this..I think my mom prepares it differently..shall find out the recipe from her. 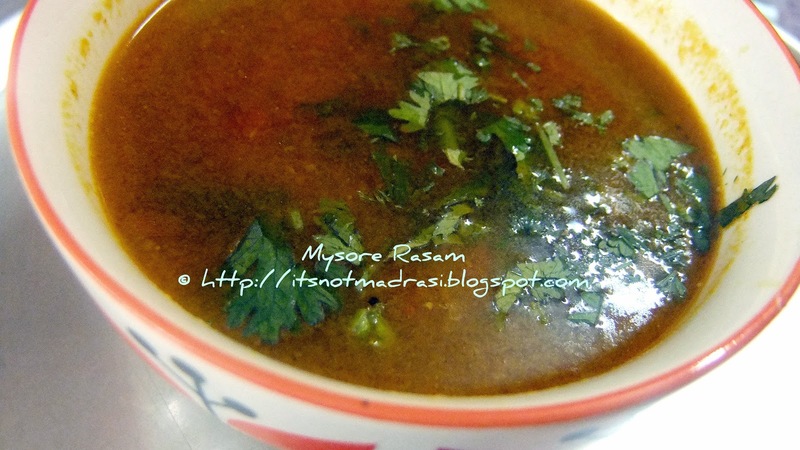 This is how we prepare reasam at home and didn't know mysore rasam is the same version. Truly a comfort food. Sounds awesome. Me too add some coconut! !Rest is all same. Such a yummy comfort food. Yum. Rasam looks divine. Now all I need is some steaming rice and appalam!